For the first time in his career, Ryan Day served as head coach for an Ohio State spring football practice. Day led the Buckeyes during fall camp last year, but it was still Urban Meyer’s program. Now he’s leading the way heading into 2019 with a new-look staff and a new-look roster to work with. After the practice, which was partially open to the media, Day held his first press conference of the spring. Here’s what he had to say. Day said it will be “really important” to solidify the offensive line. Starting left tackle Thayer Munford is out for the spring and Rutgers grad transfer Jonah Jackson won’t arrive until June. He said there was some talk of moving Michael Jordan to guard and playing Josh Myers at center late last season. Myers is going to get a shot to start at center in 2019. He said the quarterback reps were split up in the first practice, which is the plan for the spring. Matthew Baldwin had a chance to run with the ones for the first time and Justin Fields has been “sharp” in practice and in meetings. Day said the defense was “really swarming to the ball, running with energy.” He noted the unit is “really serious” with a chip on their shoulder. Day noted that he has to force himself to “walk down to the defensive side every now and then” as he takes over as head coach rather than OC/quarterbacks coach. He said he has been in special teams meetings and will continue to be, but he’ll make sure to be moving around while also still spending plenty of time with the offense and quarterbacks. Day said his “inclination” is that he’ll call plays in 2019, but will let the offensive staff handle that in the spring. 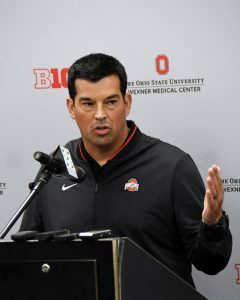 He noted that there’s a chance Ohio State could line up with the quarterback under center more often in 2019. That was an almost non-existent setup under Meyer. Day said J.K. Dobbins is “the back now” with Mike Weber off to the NFL. Noted there needs to be a focus on solid runs rather than just always looking for the home run, which Dobbins spent too much time looking for in 2018.